I loved tacos as a kid. I loved the table full of bowls of things that went inside the crispy corn shells. It was a favorite to make when we had company, entertaining and fun participation by all. I loved all the flavors and textures. I loved the messiness of eating them with my hands, picking up all the droppings off my plate with my fingers and finishing every finger licking good bit. Which was a particular treat for me as I was the queen of finishing everything on my plate as a kid. Being able to actually eliminate every last trace with my fingers was simply a bonus. Smile. 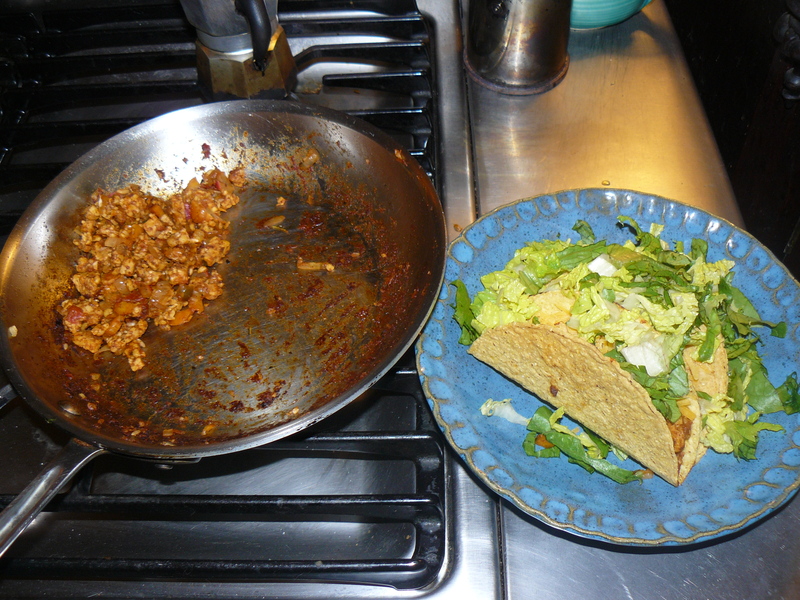 Now I can’t remember the last time I actually made tacos. Cooking without beef combined with the abundance of really good mexican restaurants these day makes it easy to eliminate this particular meal from my home repertoire. So I am surprised when I feel inspired to put the package of organic corn taco shells into my cart today. I have no idea what I am going to do with them, just that there are two opened jars of salsa in the fridge and maybe I can use them somehow. I think I can make a bean filling of some sort, make a pot of brown rice, chop some of the fresh lettuce, the usuals. There is even a package of shredded cheddar cheese in the fridge too. But I am left uninspired by this train of thought. I am wanting a taco filling that has the protein punch of what I remember. And then I think of the package of tempeh in the fridge too. It’s not easy to cook with, I have only a few ways that I like it these days and only once or twice a month at that. I love what tempeh is, a high fiber, high protein, low sodium fermented (natural probiotics) food made from whole (organic!!!) soybeans (always use organic, the non-organic varieties are made with GMO soybeans). 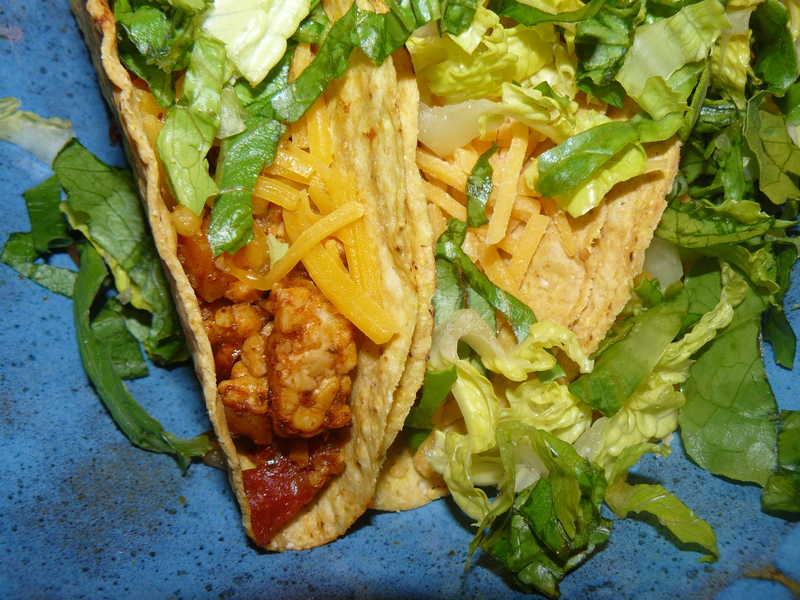 So I go ask Google about tempeh tacos and of course there is a whole world of recipes out there. I go through a few, mentally mixing and matching and substituting with what I know I have in the house. The one pound package of tempeh is cut into small chunks. I also cut up 2 small carrots and 2 large radishes into the same size pieces as the tempeh. In a medium bowl mix a heaping tablespoon of olive oil with 1/4 cup fresh lime juice, 2 teaspoons of hot Mexican chili powder, 1 teaspoon each of cumin and sea salt (my new find is Maine Coast sea salt with sea vegetables which offers a good dose of natural iodine). Mix in the tempeh and marinate for at least 30 minutes (the longer it marinates, the richer the flavor). Finally chop a small onion (or 1/2 medium/large) Add another tablespoon of olive oil to a medium size saucepan and saute the onion with carrot and radish until soft and translucent. Add in the marinated tempeh and continue sauteing for a few more minutes. The mix clearly wants something tomatoey at this point, so I opt for adding the last tablespoon in the jar of mild salsa. It still isn’t enough, so I add a tablespoon from the opened jar of organic basil marinara sauce in the fridge. This does the trick. The tempeh filling now has exactly the right texture for scooping and filling! While the six corn shells are heating up in the oven (3 for me, 3 for Molly), lettuce is chopped and cheese put in a bowl, other jar of (chipolte) salsa opened. Tacos are assembled.